Sistine Chapel ceiling is decorated with a Michelangelo fresco called “the Creation of Adam”. Nicola Pussein is an Italian painter. According to the video, strong emotions can inspire a painter to create a masterpiece. The outlines of God and the angels coincide with the outlines of the human … ! ET IN ARCADIA EGO is translated as “And in Arcadia I … “. The newspapers reported the death of the Russian painter Ivan Aivazovsky just after a rough … in the Bay of Biscay. 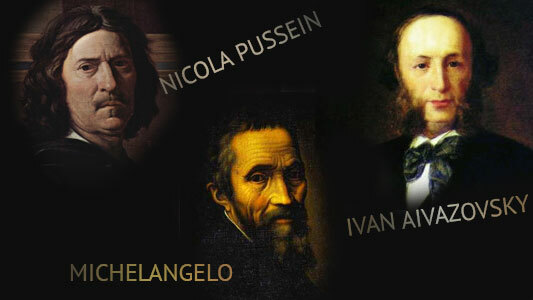 Perhaps, Michelangelo gave a kind of cipher to his descendants: human beings were created by the Brain of the (Universe)! The words scientists managed to decipher from the inscription on the bas-relief are "Pussein keeps the (key)". Aivazovsky reproduced the beauty of the rough sea on his greatest masterpiece called "The Tenth (Wave)".